"But I know Ryder and Radek are looking down at us." The mother of Ryder MacDougall, 13, and his brother, 11-year-old Radek, is reeling from the loss of her sons, and says she has "no answers" as to why the double murder-suicide happened. Tracy Stark attended a memorial with the boys' stepfather, Brent Stark, Tuesday night in from of their home in Whitecourt, Alta. They thanked the crowd for coming, including dozens of their sons' former teammates sporting Whitecourt minor hockey jerseys. "It's hard enough for an adult to understand," the weeping mother told the crowd. "All these kids — I just don't have an answer. But I know Ryder and Radek are looking down at us." "We're at a loss for words," added Brent Stark. "We don't know, really, what to say. It's been a long 48 hours." A moment of silence was held, followed by close friends and family members lighting Chinese lanterns. Family friend Rodney Koscileny said the entire town is reeling from the tragedy. "I couldn't go anywhere today in any grocery store...without everybody crying and talking about this." The boys had previously played hockey and lived in Whitecourt but moved earlier this year to Spruce Grove, where they joined their new hockey teams and started grades 6 and 8. 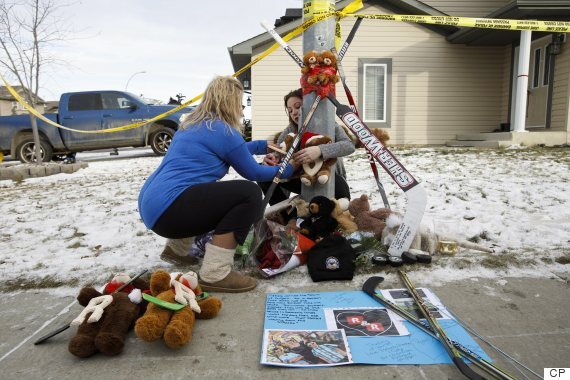 Corry MacDougall, who was 39, took his two sons to their hockey games over the weekend, and coaches say nothing seemed amiss, the day before the three were found dead in what police say was a double murder-suicide in their home west of Edmonton. Radek, 11, was on the ice with the Spruce Grove Sabertooths peewee team early Sunday and was disappointed the concession wasn't yet open so he could buy a big bag of Double Bubble gum that he often passed around to teammates, says coach Brendan Ardron. Radek gave no indication there were problems at home with his father, said Ardron. His big brother, 13-year-old Ryder, played Sunday night with the city's bantam AA Timberwolves and was benched for part of the second period after a penalty. Coach Dallas Ansell says the quiet and loyal defenceman had improved over the season and was coming out of his shell and cracking jokes. The father sat quietly during Ryder's last game, and chatted with a videographer who was recording the play, added Ansell. A parent in the stands said MacDougall also asked her that night about the schedule for a tournament over the Christmas break. The two coaches and other hockey officials, along with a pastor and a chaplain, gathered with players in an arena room Monday after learning the boys had been killed. "It's OK to cry" and "it's OK to not be OK," Ansell said he told the young players. There were lots of tears, added Ardron. "It's a pretty hard pill to swallow as an adult, let alone when it's a kid and your friend has passed away for no reason," he said. The coaches said stickers with the brothers' hockey numbers — 8 for Radek, 3 for Ryder — will be on put their teammates' helmets for the rest of the season. Signed jerseys will also be given to the boys' mother. 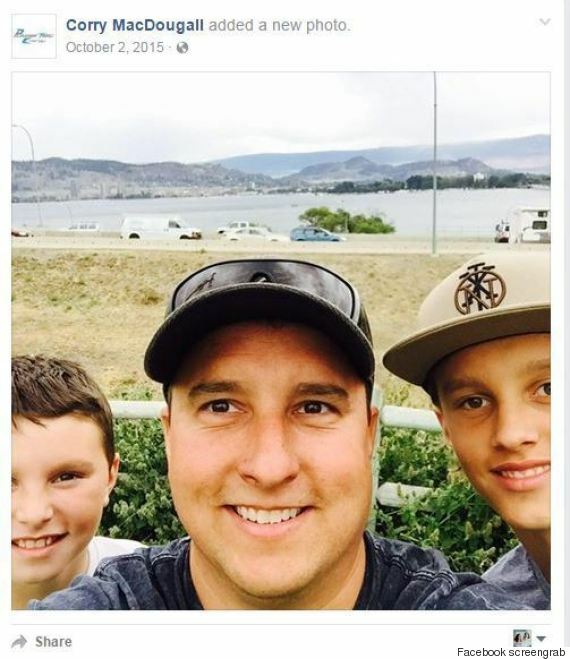 Corry MacDougall posted a photo on his Facebook page last year of he and his sons, all three smiling near a lake. The only recent entry was a copy of an Edmonton Oilers logo. He listed himself as owner of two companies called Cemac Compression and Powertec Energy. His aunt, Delores MacDougall in Edson, described him as a kind and doting father and said family members are struggling to explain the deaths. "I don't know what happened, but that wasn't him," she said. "He pedalled those kids to hockey all the time. He loved those kids. That was his life." She said he and his wife had split years earlier and, although she believes he currently had custody of the boys, she didn't know if there were plans for it to change. "Corry was a good father and what went wrong, I guess, we'll never know."